Sometimes you just need to win a fake argument with a stump that kinda looks like your crappy friend!!!!!!! I honestly had so much fun with this page. I have a love/hate relationship with drawing the outdoors. And, as promised, site changes :D My friend made a threat mockup of up what the site will look like if my future Patreon goals aren’t met, lol (don’t worry this is a joke). Yep, the hiatus ended once updates started again. I’ll continue to update here 1x a week on Thursdays until I finish my current freelance thing, then probably going up to 1-2x a week (on this comic, in addition to 1-2x a week on Mare Internum) after that. Good times. 2-4 Meek/Mare updates a week??? Wow. Don’t… pull an art muscle or something. In the meantime, I will be over here on the East Coast, enjoying your beautiful artwork and storytelling. You really are one of the better artists and storytellers I’ve encountered. It would be great if you could support yourself by doing your own projects. Oh! In the fourth panel it looks like Angora is wearing a loincloth instead of pants… her left thigh appears to be exposed. Accident? I have monologues in the car, Angora. You’re not alone. The lighting is beautiful throughout this page. The lighting in panel one is gorgeous. Great soft colors, and great use of fading to evoke depth. I also noticed that the sunlight in that panel is focused on Angora… nicely done, be it intentional or instinctive or… a complete accident, haha. That log in the third panel reminds me of Sequoia National Forest. Mmmm. Angry and talking to herself… or that former tree anway. Really though, her argument is infallible. He’s totally stumped. where’s salamanderfriend when you need him?? Man, i realy do love the colours of this page! Yaaay! 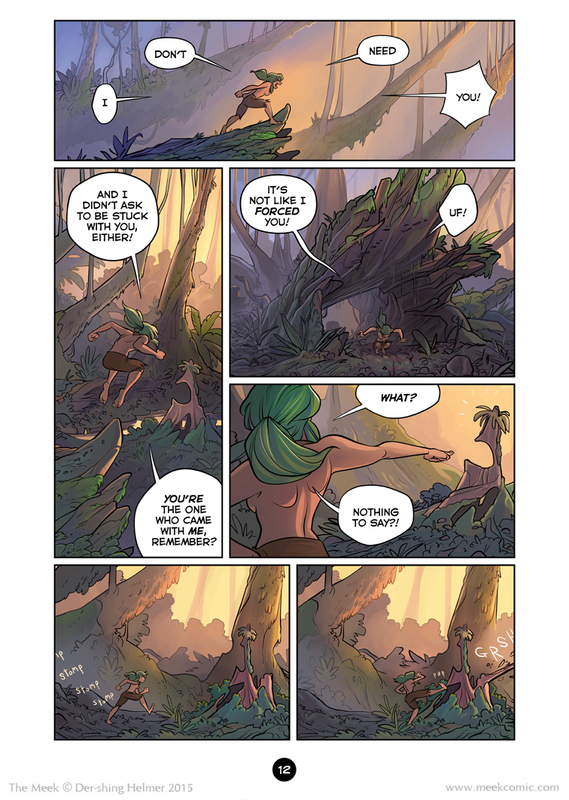 The fabulous colors…the intricate linework…the yelling at tree stumps– I love this comic! I’ve yelled at tree stumps too. Kicking the back out of them not so much. Hooray! The angry half-naked green-haired chick is back! Where did the tree that fell over come from? It wasn’t in the panel where she’s stomping up to the stump. FWIW, I think the lime green really works with the black/dark blue/darkish teal thing you’ve got going on. Hooray!! You’re back!. Just checked in and was surprised and happy for your return. Hope all is well with you now. I’m so happy to see Angora again! It seems appropriate that after all that time, our first reintroduction to her hides her face. The colors on this page are great, too. Something I noticed is that the transition between the last page and this page seems a little bit abrupt. I think the transition could be smoothed if the first panel were pulled out a bit, to make it more of an exposition shot (the dialogue would still work though!). It would also add a little bit of variation to how much of the background is seen from panel to panel since it feels to me like it mostly stays in the middle-ish shot area. Just some thoughts! I’m really looking forward to the coming pages. Valid thoughts! I’m actually happy with this as it is though. Just from a shop talky perspective, I feel like opening with an establishing shot is kinda safe/ standard, but it’s equally valid to establish a change of character focus first and the enviro later. Pulling out more to show a larger area would diminish the desired proportion of Angora to the enviro (making her seem too dwarfed and less of a “challenger”). And of course because future readers will eat these set of pages in 3 mins and not 6 weeks, haha. Though tbh I had written this page originally with a sky transition to mirror page 1. If I come back to this page later with your concern, that will probably be the solution. Thanks for your reply! It’s really cool to hear what your mindset behind the page layout was. I’ve never considered that bit about establishing change of character first, definitely something to keep in mind. I guess she’s stumped as to what to do next.